You can build just about anything using WordPress. With thousands of themes and plugins, anyone can access the features and functionalities they need to achieve their goals. But for a person just starting out, all the options can be overwhelming. Rather than be a source of inspiration, the choices can become a blocker to launching that brand new site. To solve this problem, we've developed a WordPress Starter plugin that takes the confusion out of building a new WordPress site. Our plugin walks you through a curated number of themes and the most common site features so you can choose exactly what you need and launch your website more quickly. When you build a WordPress site with SiteGround, our system installs a fresh WordPress site with the default Twenty Seventeen theme. Until today, our guided setup stopped there. Now, all new WordPress installations on SiteGround come with our WordPress Starter plugin, which takes the user experience one big step further. When you log into a new WordPress admin for the first time, you will be guided through a short site-building process that includes selecting a theme with demo content and adding basic website functionalities. Once you've made your selections, all your choices will get installed and you'll have a fully-functional site -- right out of the box. Then you can start customising it with your content and media. The first step in the WordPress Starter process is choosing a great theme, the foundation of your site's look. When installing a new theme, however, many beginners struggle to achieve the same look as the demo site. That's why we're giving customers a jump start on customising their theme with easy-to-edit placeholder content. The pre-populated content makes building pages more intuitive so you use the theme to its full potential. Choose from a curated list of exceptional pre-populated themes organised by category and industry. OceanWP specifically designed these themes for SiteGround and our clients can take full advantage of the handy time-saving demo images and content. If the functionality is already built into the theme or the demo content, we won't ask again if you want to add it. For example, we'll assume if you've chosen a portfolio theme, you want the gallery feature. Our goal is to limit the number of decisions in the website-building process, so you can focus on precisely what you need. Using the WordPress Starter can also save you the task of searching for and evaluating plugins. We've hand-picked the best plugins for the most common website needs based on our knowledge and experience. We've partnered with some of the most popular, easy-to-use, and highly-rated plugins to offer an even more seamless experience to our customers. Choose from WPForms, FooGallery, Yoast SEO, Monster Insights, The Events Calendar, Optin Monster, WP Google Maps, Jetpack, and WooCommerce. We're grateful for their cooperation in the development process. Although the default WordPress dashboard is quite flexible and customizable, it can quickly get cluttered by theme and plugin notices, advertisement, and other information. That’s why we’ve decided to replace the default dashboard with a simple screen that will help a beginner quickly navigate to content editing or to the settings of any installed plugin. Ready to test the WP Starter yourself? Start a fresh WordPress installation through your User Area and log into the WordPress admin. We would love to get your feedback on the new experience. Please use the comment form to give us your feedback! All suggestions are more than welcome as we aim to continue developing that starter process and make it even more useful for beginners. Have your own setup workflow? No problem! You can easily exit the new Starter experience and revert to the standard WordPress dashboard through the links at the bottom of our interfaces. Great work Hristo and the SiteGround team. It looks great ... I love it! Adding Elementor to the default plugin installation list was well thought. I've used it to built over 10 website and I find it way easier compared to other page builders like VC or BB. If you're not sure of how it works, I've actually wrote a case study after redesigning my whole blog with it. Otherwise, Elementor is a great addition to the default installation on new siteground accounts and way easy to learn and use for anyone beginning out there. They have added the Eliminator as a default plugin? This just keeps getting better! Right now, it's default for all themes because they all work with it! I hate all the new stuff. I stopped using and recommending Bluehost because they started doing too much "help." Now you guys are doing it too. By trying to help, you are making things more complicated. And when I want to teach my clients how to work with Siteground and WordPress, everything goes out the window because there's all this other stuff happening now. Honestly, if you want to start with a blank WordPress site - it's now easier than before - hit the exit button of the Starter and remove the plugin afterwards. You will get a completely default WordPress installation with no content, custom themes, etc. Just the SG Optimizer plugin so it works with our caching systems. It's an effort to help beginners and people new to the WordPress ecosystem to start and create a functional website but we always care about flexibility and experienced users like you. The system itself is very nice though! It's cool that you guys built it in React and it will be interesting to see how it evolves over time. I understand the business reasons you've done this, it just doesn't match up with the SiteGround I love. Trust me when I tell you that Bluehost are not a role model for us 🙂 However, I understand how this may look as a step in that direction. However, once we update the rest of the system, it will be much, much better for both beginners and professionals. Right now everyone gets the Starter but soon we will be able to show it only to people who actyally want it. This is a bad move. My first reaction was that I'm now gonna have to get rid of all these plugins before I start working on my next site. You didn't decrease my workload, you increased it. Next, how is SiteGround assuming that these are the themes and plugins most people want. Really? I've been building websites for more than 15 years and I know the best wordpress tools and some of these tools, even the well-known ones are not nearly as good as the plugins I use and recommend. My guess is that every plugin that siteground has an association with, is now being shoved down the necks of every new client so that siteground can make more money from these partnerships. For long I have recommended siteground as the host of choice but now I might have to reconsider if siteground doesn't roll back these changes. Greed, it seems has gotten better of this hosting company and now it seems siteground will, at least in my book, be joining the ranks of pushy hosts who are just out to make a buck. Horrible decision guys. Revert it ASAP. Thanks for the feedback! It's a feature toward the new WordPress user and I am sure that the sample data plus a visual editor will help many people build a functional website that would otherwise go to services like Squarespace for example. I have noticed that there might be a bug related to this new plugin. I've seen the installer fail like this 2 times out of around 10 installs - https://i.imgur.com/FGpEosI.png. It might be unrelated, but I wanted to alert you to it. I've always considered SG ideal for professional web designers and Blue Host for newbies. Looks like SG is now focused more on newbies as well. Professionals may end up looking elsewhere for services that are more about quality than hand-holding. IMHO. Indeed, that service is focused towards beginners and newcommers to the WordPress world. However, it's part of the bigger update and soon we will have options for experienced users. Meanwhile, you can simply skip the Starter. Bad move, seriously........... you've just created extra steps in the work flow that aren't needed, especially for resellers. I don't want to login and delete this new plugin, it shouldn't be there in the first place or the SG optimiser. If I want a plugin I'll go find one. Please stop making plugins and concentrate on hosting. I have two sites on Siteground, one of which has not been developed at all. Can I get access to this new WordPress Starter for that site? When I say that the site is not developed, it does exist (with a theme imported into it) but it has no content! Can I just re-install WordPress onto it and will that then wipe what's already there? 1) Are any of your themes responsive? I've looked at several demos and I'm not seeing it when I resize my browser width. 2) I'm not clear on Elementor. Would this replace creating child themes? All of the featured themes are responsive, not sure why they haven't moved, we plan adding mobile views on the demo lightbox soon to make that easier. As for Elementor - it's a page builder, one of the best in my opinion, but using child themes is still a good practice! I have a working live site on a multi site installation of wordpress. I want to start another site but i dont want it live for some weeks so i can work on it. I have heard many themes wont work on a multisite wordpress installation. 1. Can i change a multisite installation to a single site?? 2. If not can i use this new help for new websites on the multisite wordpress i already have?? and use it on the new site? Yes, you can migrate away but it's not that easy. Here's an article on how to do it: https://www.wpbeginner.com/wp-tutorials/how-to-move-a-site-from-wordpress-multisite-to-single-install/ As to your other question the Starter is not designed to do that in general and I am afraid it will not work in your case. Our website is hosted by Siteground but not a WordPress site, how difficult is it to transfer our current site to a WordPress site. I don't want to lose the functionality of our current site. Really depend on your current site but it's usually generating a site anew on WordPress and them importing your previous content. 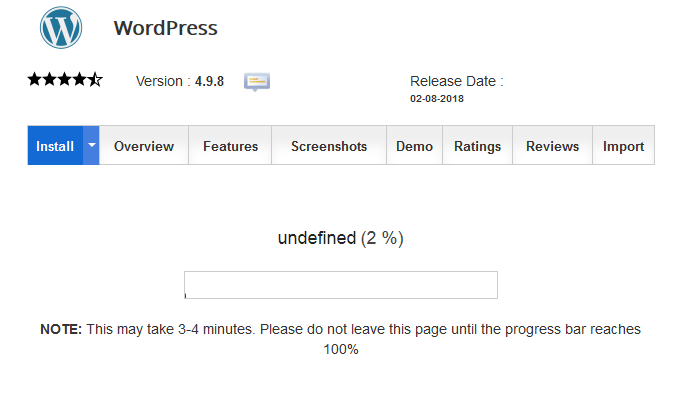 1) Will this new Siteground plugin be applicable for wordpress websites already in development and nearly completed or will it restore the existing site to a blank wp website? 2) As a newbie, I still need to learn what functionality/safeguards I need to have in place just before I publish, will this new Siteground plugin trigger recommendations so as to have the pre-publishing basics covered ? The answer to your first question is No - it's designed for new installations and help beginners in WordPress to create better and more functional sites. As to your other question - that's a very good recommendation and we will most definitelly look into it for our next updates but for now we lack this functionality. Right now we've focused on having recommended content, sample data that you can edit and a cleaner Dashboard. This is a good service to make available, though I'm not sure whether I'll use it--I mostly do manual installs to avoid extraneous stuff. For people who aren't developers, I think it's going to be helpful. However, I really take issue with the statement "Everything Starts with the Right Design." You can't possibly know what the right design is until you've decided on purpose, functionality, and content. You need to make some of those decisions before you get to the building a website part, but you shouldn't be trying to fit everything else around your design. It makes much more sense to start with "What kind of site are you building?" with a selection of, say, "Marketing," "Blog," "Store," "News," "Community" or whatever the most popular site types are, and move from there to selecting specific features and plugins, and THEN choose a theme that's appropriate to the kind of site you're building. While a well-built theme should be able to display output from any well-built plugin, starting with the theme is likely to send the new site owner down a rabbit hole for hours or days...a process s/he may have to repeat after going through the rest of the process. (Gosh, Sallie, tell us how you really feel.) I'm a big fan of SG and I really like the idea of an onboarding process, but my experience has shown me that the theme really shouldn't come first. Thanks Sallie! There were many questions on how to approach this. We've made it so flexible that once we gather some more data we can adjust the process the way people really feel best using it! SG you never stop amazing me. I am so glad I found you 5 years ago from a WordCamp training day about installing and using WP. They gave away a free year of SG to play with the site. I have never left since and never will. Everytime technology or web standards change, you are standing strong and are up to date and offering easy tools to get people up and running on your hosting platform. Your Customer Service ROCKS big time with friendliness and helpfulness. There is a bit of accent barrier, but I am willing to slow down and listen carefully and be kind on the phone, knowing the situation will be taken care of properly. Chat help is just as awesome! I enjoy picking up your signature socks at a local WordCamp. I sing your praises all the time and as far as I am concerned you are THE ONLY WP hosting company that I will ever recommend to my client or will set them up on. Everything else is substandard in my loving view of you. Keep ROCKING the Internet with WP!! I've noticed that the WordPress Starter plugin is not compatible with https://github.com/TGMPA/TGM-Plugin-Activation. This is very important for our clients as we require certain plugins for our themes. It is leading to support requests (probably for both of out companies) so it would be good to fix that asap. Thanks for reporting this, I will look into it asap! It's bad move from my viewpoint. This might be great for a DYI website newbie. However, for a website design agency like ours, you've just created a boatload of additional work. We will have to delete all of this from our new WordPress installs. We have our own list of standard plugins and themes that we install. Why force this on everyone? Why not have a checkbox to decide whether to install all this junk? It will probably be less work for us to download WordPress and do a manual install than to spend our time deleting all of this bloatware. Did you reach out and ask any of your customers if this was what they wanted or needed? Especially any of your website design agency clients? I don't see how that creates additional work for agencies - it's a single button click to cancel the entire process and the rest is simply a plugin. Yes, we have asked our customers in surveys and multiple times in personal conversation on conferences, and newcommers do struggle with a completely blank WordPress site. However, in the beginning of the next week we will add a checkbox to our WordPress installer which will ask you whether you want to use the WordPress Starter or have a completely blank WordPress installed. ignore all those snobby techies! Of course there are lots of us who want blank WP sites and are happy to configure it to our needs, but there are also loads of people who just want a website, AND the good service that goes with a company like Siteground but get put off very quickly by the process. I've just setup a site for my 77 yr old Mum - stuck a basic theme on and a page builder (I've been using Beaver Builder but am willing to give this freebie a go). She's working away now - for people like her who are tech-willing and tech-comfy but not necessarily tech-knowledgeable this would be great. In my professional life I'm a learning technologist - and I can tell you that there are a LOT of people who want to be blogging in Higher Ed - building communities of practice, networking, creating e-portfolios and resume sites and marketing their courses - and none of them want to learn how to build websites, and nor have they got much cash to pay someone else to do it! People still assume it's really hard! I for one will be looking into this with great interest - and may well be talking to you soon about tweaking it slightly for an e-portfolio in education model. There are different people with different needs. When you host so many sites it's a challenge to make your services good for everyone. We always believe that customers should have flexibility and options and so we will add an option to have a blank WP installation to the process so professionals can start right away, while newcommers to the WP world can have an easy start. Thanks for continually making things better! I tried one of the WordPress starter sites and it will work great. The footer says, "COPYRIGHT - OCEANWP THEME BY NICK" My question is, what is copyrighted? I do not want to use anything that is copyrighted unless I have permission to use it for me and for others. Can you tell me more about this please, especially what can be used and what cannot? Good job. I am a supporter of Siteground. Nothing is copyrighted, it's a placeholder text to show you where to add your own copyright text. However, I will change that on demo content to avoid future confusion. Thanks for reporting it! I've already had a WordPress for years but it's outdated and I would love to have someone at Siteground recommend someone who could take a look at my site from the backend and make recommendations about how to install plugins or update old ones, whether I need a new theme etc so that I can be sure I don't have security vulnerabilities. If you have partners you can recommend I would appreciate it! Thanks for reaching out! I suggest you turn to our partner Codeable. Codeable.io is a WordPress exclusive freelancer platform that connects thousands of customers like you with WordPress freelance experts to work on WordPress projects of any size. We recommend them for the high-quality of development services they offer. As a SiteGround client, you’ll get a $60 discount on your first project posted with them. All you need to do is go to your User Area and click on the banner featuring Codeable. You’ll be redirected to the Codeable site. Click on “Get a $60 Credit” to launch the submission page, where you can describe your development needs using a custom form created for SiteGround clients. I hope this helps and all the best! Hello, I recently tried using WordPress Starter plugin and for every new website I create, the WordPress Starter fails to install. It gets stuck on the last step and eventually times out. Not quite sure how to proceed. Please, post a ticket in your Help Desk and we will look into it in details! I've been trying to find the theme I selected in the starter and cannot. It was under the blogging section (I think). Do you have a list of the themes that are used in the starter so I can search for the one I'm looking for? Just clear your browser cache completely and restart it. Hope the support has assisted you. The themes and sample data right now is available only via the starter but we will soon update the plugin so you can install them on a later time through the WP backend. Would be nice to have custom WP setup that you can save, using your own options. Every time I install WP, I have to waste time turning it from a blog into a website with all the annoying settings. Would be good not to have to do that every time via the install. I know there are other ways to do this outside of SiteGround, but I prefer setting up on the same server I install on. There's a checkbox you can untick and get a blank WP site! The template idea is great and will get into the planning of our next udpate! I've been working with computers for almost 30 years now and all I can say is, people hate change. Hence why most of the users are whining about this huge change for them and God forbids, all the "bottlenecks" you're creating for their dev teams/marketing agencies. I'd take their recommendations with a grain of salt. There is some valuable feedback here in there but I honestly wouldn't lose a night of sleep over the comments I'm seeing previously posted. Look forward to see what kind of changes you introduce to both new WordPress users and the more experienced people as well, cheers! Had to write just to agree with sergio felix. Its a 1 step change to a workflow that lowers the learning curve for new people drastically. Theres no way these "companies" are even qualified to be called web developers if theyre too lazy to implement 1 step into their workflow. Now, i reeeee away back to working on SG sites. Hi, the starter plugin is nice, but I just found an issue with it. I installed a new site and following that invited a user as Editor. When he tried to login, a "you don't have permission..." screen appears to him. The same happened for every other level except as administrator. The thing was that in fact the user had some limited access, but was prohibited to see the dashboard, where the user is redirected after login. After breaking my head trying many things, I found that the problem was with the SG starter plugin, disabling it was the only thing that fixed it. Thanks for the feedback, will look into this in details and apply a fix in the upcoming update. You mentioned that you partnered with Yoast SEO. Does it mean that we get a basic version of it or the Premium one? Thanks. It is the free version of the plugin. Great feature. As a beginner it helped out a lot. I was wondering how can I use it again to choose a different theme? Right now you can't without pre-installing WordPress but we're working on the next update where you will be able to use those directly from the themes panel. Love it but I wanted to reinstall to start the starter again, I deleted the wordpress install and reinstall it with the starter and load wp admin page and it automatically takes me to "congrats your site is ready 3/3". Doesn't allow me to start from beginning and select template/ plugin options? One of the things that May make some of the professionals relax a little bit, is that, from what I understand, the base theme in use here is Ocean WP - Which has a really strong reputation and just past 350,000 installs. And the thme library has a variety of theme types that can be further modified after creation.. Ocean WP has been aroudn for over 5 years, and is a clean, light, mobile=rsponsive theme, that happens to work well With Elementor. So, for the small biz DIY'er who can't afford a pro - at least these sites are built on a solid foundation. And it sounds like there is a one-button uninstall option for professionals. I do have 2 questions, however, what happens when a small biz owner decides they wnto use a different plugin - First - can they also add or remove plugins that were installed - what if they wanted to use All-in-One-SEO-Pack, instead of Yoast; or what if they wanted to upgrade and use the Paid version of Yoast. Or What if they wanted to use the Paid/Premium version of the theme OceanWP? Is it just a starter experience, or can you use the starter kit and then step outside of the box. Also - what if they decided they have outgrown this theme and starter plugins - what happens if the go to move to another theme, or use other plugins etc. what happens if they turn the plugjin off? Anyone used this successfully in the last few days, mine just sits there at Installation in progress but never goes anywhere. Tried a completely fresh install but no luck. We tested on our end and the plugin works normally. Please try again to use after you clear your cache and cookies. In case the problem persists reach out to our team directly so we can troubleshoot.